Why would Dad need a waterproof camcorder? Maybe there's more to his goings-on than you know about. Or maybe he's just clumsy. 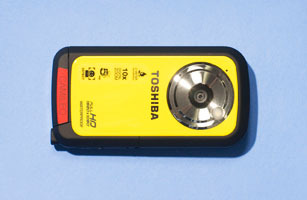 Whatever the case, Toshiba's cool and pocketable Camileo BW10 camcorder costs $150 and works fully submerged in up to 6½ ft. (2 m) of water. That'll allow him to capture that epic trout in full 1080-p high-definition video before it even gets pulled out of the stream. And a built-in HDMI port will let the whole family watch the action on the big screen once he gets home.